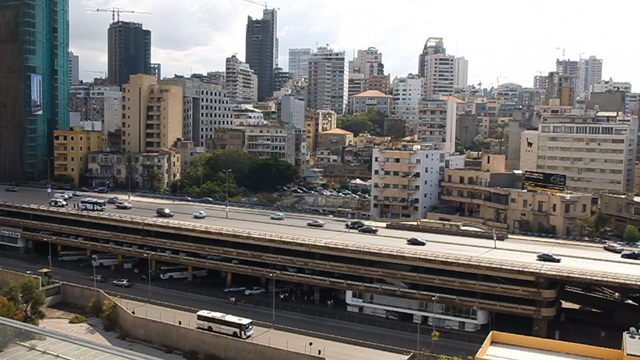 The consequences of the Lebanese Civil War in Beirut’s public transportation are exposed through the film “Under the Bridge” by Melbourne-based filmmaker Nora Niasari. By studying the past and present, we can lay the groundwork for new thinking. Beirut’s public transport infrastructure has experienced a lifetime of conflict in its struggle to provide an ongoing platform for citizen mobility. Through the window of history, we can retrace the establishment of the Lebanese railway system to the beginning of the twentieth century. These railways not only connected the major cities in Lebanon, but neighboring countries including Syria, Iraq and Turkey where the line operated along the famed ‘Orient Express’ train route from the late 1920s to the 1940s. Today, such developments for infrastructure seem unimaginable with the ongoing socio-political struggles in the Middle East. In Lebanon’s case, years of war and post-traumatic recovery have created uncertainty for the future of its public transport infrastructure. Since the beginning of the Lebanese Civil War and the collapse of Beirut’s public transportation system, three key developments have taken shape: Cola Transport Hub, Dora Transport Hub and Charles Helou Bus Station, which embody the ongoing failures and conflicts of contemporary Lebanon. During pre-war Beirut, ‘Sahet Al Borj’ (Martyrs Square) was the centre of the city in the downtown district, a vital artery for private taxi services and the renowned ‘Tramway Beirut’. In partnership with Electricity of Lebanon (Electricite du Liban), the tramways were powered by electrical power stations and operated along rails throughout the streets of Beirut. Buses were introduced by the public transport sector in 1964, replacing the tramways with a fleet of 138 ‘Renault’ brand buses. Through a network of lines and stops, these buses successfully linked outer suburbs, metropolitan districts, roads, and streets of Beirut within an interval of six to seven minutes for each bus. In 1975, the Lebanese Civil War broke out, completely destroying the historic railway system and the fleet of buses, marking an end to organized public transportation. Everyday mobility for Lebanese citizens ceased to exist as transport nodes in Beirut were the first to experience destruction, creating barriers and borders in every district. Within the chaos of the Civil War, ‘Sahet Al Borj’ (Martyrs Square) became a no-man’s land due to its location along the Green Line and people were displaced to the newly established transport hubs of ‘Dora’ in Bourj Hammoud (Christian East Beirut) and ‘Cola’ in Tarik Jdideh (Muslim West Beirut). Located underneath populated highway bridges, Cola and Dora operated as productive intersections, using the cross roads for economic growth and social interaction. People from the outer suburbs of Beirut would travel to these hubs early in the morning to set up market stalls whilst private taxis and mini buses would transport citizens between the shores, the Bekaa valley and mountain villages to the north and south of Beirut. 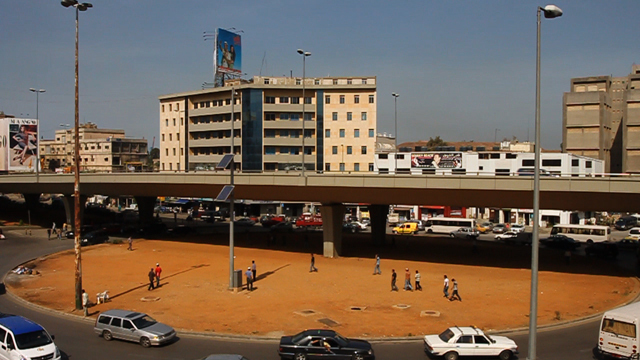 Due to their dependency on the residential areas surrounding them, these roundabouts provided a layered activity that removed them from the statically-enforced characteristics of infrastructure and providing a new platform for the operation of private transport companies. With the destruction of the buses and railways following the Civil War and the rise of informal transport hubs, the public transport sector experienced a seven-year halt to operations. Following this period, the Lebanese government purchased a fleet of secondhand buses from France to re-establish the public bus network. These buses were stored in the airport warehouse where they were partially bombed during the Israeli invasion of 1982. During the internal war of 1989-1990, the remaining buses from 1982 were stored in the Christian area of ‘Bir Hassan,’ where violent sectarian clashes destroyed them completely. 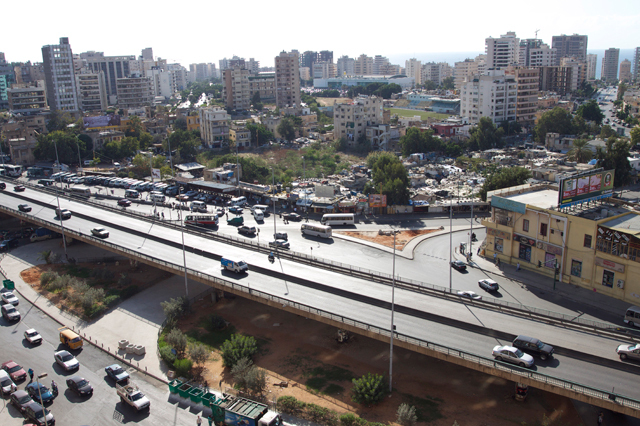 Despite these conflicts, there were a handful of 40 buses still operating on the main roads of Beirut until 1996-1997. Realizing this number was not sufficient for the urban population, the Council of Ministers in Beirut purchased 200 buses of ‘Karossa’ brand from the Czech Republic. Not only were these buses the incorrect size for the Lebanese terrain, they were designed for an average climate of -20 degrees, which did not meet climate specifications for safe operation in Lebanon. This led to countless irreversible malfunctions and breakdowns in the buses because no money was allocated for spare parts. Year after year, the number of buses declined until they reached absolute failure and became ruins to the conflicts that destroyed them, essentially neglected to death. In post-war Beirut, public transportation has been silenced whilst private transportation companies are providing a short-term solution for mobility. 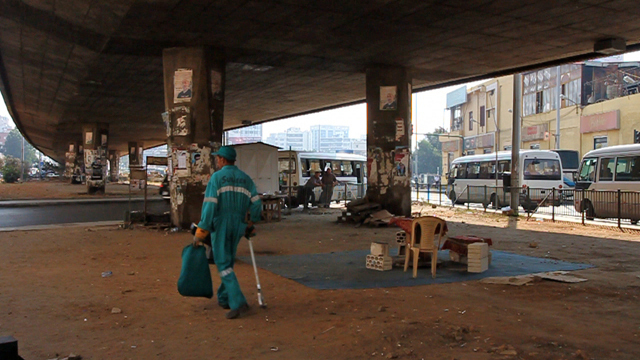 Abandoned buses and tramways can be seen as tombs from a distance in ‘Bus Cemeteries’ located at the central stations of ‘Mar Mikhael’ and ‘Sahet Al Abed,’ with one or two caretakers watching over 500 buses on a daily basis. Cola and Dora still remain as central transport hubs, however, their socio-political fabric has changed significantly. In Cola, political forces including Hezbollah, The Amal Movement, and the Lebanese Army govern an overlapping area of Shiite and Sunni Muslims in South-West Beirut, where rising tensions and clashes are ever-present under the bridge. Independent bus and taxi drivers are suffering due to the extreme monopolization of bus depots by private companies, creating chaos and a feeling of constant fear in their daily activities. This chaos is mirrored in the Dora roundabout, where Syrian workers as young as fourteen occupy the large expanse of orange dirt under the bridge for days and weeks without jobs. Whilst having no social integration with the Lebanese population, they travel from Syria early in the morning at the prospect of getting picked up for manual labour to support their families. 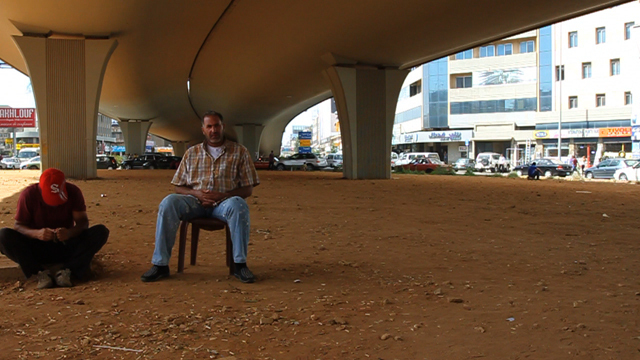 These transformations are evidence that the transport hubs in post-war Beirut are not only zones of conflict at a local level, but are symbolic of the sectarian struggle that divides Lebanon today. Whilst Cola and Dora have operated as informal transport hubs since the beginning of the Lebanese Civil War, Charles Helou Bus Station, a damaged monument to the Civil War, was re-established in 1995-1996 to formalise a central terminal for Beirut’s private transportation sector. Located in the industrial port of Beirut, the investment of this colossal multi-level terminal was intended to create an organized system for the operation of all private bus and taxi companies. By the year 2000, management changed and companies began to operate independently of existing regulations, creating conflict between these private offices and Beirut Municipality. Many offices left and operated elsewhere, which fell against the wishes of the Council of Ministers to limit all long-distance ground transport to Charles Helou. As a result, Beirut Municipality limited the maintenance of infrastructure within the station, including office spaces, shops, mini-markets, public toilets, car parks and sidewalks, causing the station to rapidly deteriorate. 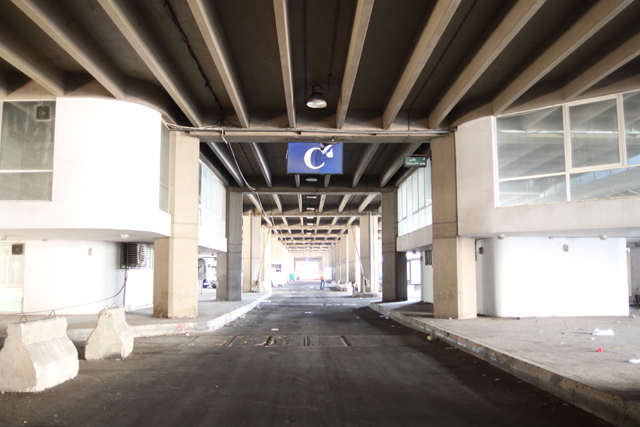 In its current abandoned state, the ground level of Charles Helou operates as terminals for buses and taxis where you will find informal food stalls, roaming salesmen and a makeshift Islamic prayer zone whilst the upper two levels remain vacant and solely operate as a void for projections of what the city could be. Through these atmospheres of chaos and conflict, it is clear that Cola, Dora and Charles Helou Bus Stations have the incredible potential to act as catalytic engines to transform the synergy of social and economic life in Beirut. And while the buses remain standing in the cemeteries amongst the wild growth of nature, the private bus companies continue to monopolize the system and disregard the necessity for change in a country struggling to recover its lost identity. The sheer immobility of Beirut’s public transport infrastructure emphasises the nature of post-war development as both a constructive and deconstructive act where the deficiency of a centralised control has caused the failure of implementing a public service for its people. The solution remains undetermined in a system with no time frames and no political commitments, creating conflict within all institutions seeking to rebuild the longevity of Lebanon’s civil services. Beyond the economic and social values that could be achieved, the future success of these developments could ensure the hopes and aspirations of its people beyond a short-term expedience of corporate profit that currently overshadows the long-term potential of rebuilding Lebanon. Nora Niasari is an Iranian-Australian documentary filmmaker based in Melbourne, Australia. Over the course of her architectural studies at the University of Technology, Sydney, she directed and produced a number of short films that have been screened at festivals such as the Aljazeera International Documentary Film Festival and the Cannes Short Film Corner.